I define a powerful song not by how strong it makes me feel, but rather how weak it makes me feel on the very first listen. The first time I hear a powerful song, I want it to leave me in a cold sweat, breathless, thinking “what has just happened to me?” Then, I want to grow to make the song a sort of personal empowering anthem. I assembled my list after much careful consideration. This was harder to do than anticipated, and may have been another contributor as to why the list turned out a little longer than expected. Enjoy! 15.) Alumina – Nightmare: This song isn’t just powerful, it’s very disturbing. The mournful tone in which Yomi sings the song is downright eerie. The first time I heard this song was on Death Note, naturally. It frightened me terribly, which is a big reason why I respect this song as much as I do. 14.) Border – Girugamesh: From the first notes of this song, I just knew it was going to be intense. I feel like the boys from Girugamesh are grabbing me by the hair and dragging me relentlessly through this song. It’s intense and brutal. The vocals and guitar are positively barbaric. 12.) Bel Air – Malice Mizer: Hard to believe this song is as old as it is, yet its strength continues to rattle my skull (and the skulls of many other VK fans I’m sure) to this day. The music box playing at the beginning and middle of the song contrasts wonderfully with the hard guitars and drums found in the song. GACKT’s performance is outstanding and fierce. 11.) Rainbow – Ayumi Hamasaki: Made exclusively for her A Ballads album, Ayumi’s breathy ballad has been breaking hearts for years. This song has so much power in its simplicity, rather than any actual muscle. “No rain can get the rainbow.” Remember that. 10.) Passion – Utada Hikaru: Don’t you miss this Hikki? Utada, this is the one. Not your washed-up American crap that flopped horribly time after time. This. Passion is a song full of light and darkness at once. The beat of this song is indescribable. 9.) Hallelujah – Rurutia: Okay, so if hard guitars coupled with elegant violins weren’t powerful enough, you get the contrast of Rurutia and her famous whisper-singing. The opening of this song is like getting hit in the face with a shovel made of solid gold. 8.) Renon – M: This song is still relatively new to me, so I won’t pretend to be a seasoned listener. Still, its MUCC-esque guitar style and raw, untamed vocals floored me from the first listen. The vocalist has some serious charisma even though his vocals aren’t up to par with other VK singers by any means. 7.) Rain – GACKT: Do you ever hear a song that makes you hurt all over? This song fits the bill for me. I feel like I’m drowning in some kind of torrential, yet gentle wave during the verses. In the chorus, it all comes crashing down. I never hear much mention of this song, which is sad. 6.) Kingyo Hanabi – Ai Otsuka: I had to find a place for my favorite song on here somewhere! It’s not as powerful as other songs, per se, but it still packs a heartbreaking punch. The tortured desperation in this song is incredibly moving. This song can make me happy and sad at the same time, which is rare for a song to do. 5.) Rain – SID: As I mentioned on my “weekly babble” post, I have decided that songs titled Rain are predestined to be good. The chorus of this song is tragic with strong feelings of loss. I think the majority of this song’s power for me is how well it ties in with the Fullmetal Alchemist story. 4.) Lust for Blood – GACKT: This song is probably the most hateful song I have ever heard. 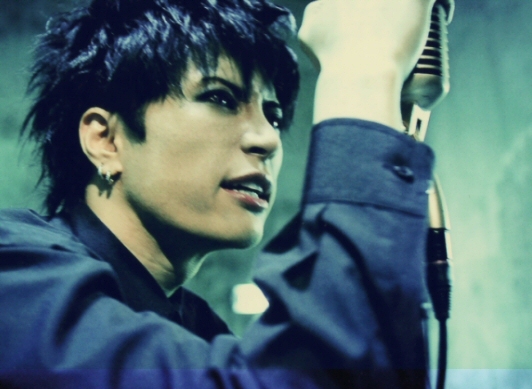 The melancholy opening makes way for a heavy rock sound and GACKT’s intense, angry vocals. It’s a heart-stopping piece just because it is SO raw. 2.) Mirrorcle World – Ayumi Hamasaki: Is it bad that I don’t think Ayu has released a single good thing since this dropped over two years ago? (Sparkle was okay, but not anything I couldn’t live without) Ayu is a powerhouse in this song, singing along with a military-style beat and angrily questioning the problems in the world today. The lyrics are expertly crafted and I love the energy. 1.) Jesus – GACKT: GACKT’s big comeback single after Returner was incredibly anticipated, and this single did not let me down at all. In fact, I think it is one of the greatest GACKT songs to date. The heavy rock sound, GACKT screaming, the lyrics, GACKT behaving in such a taunting manner in the PV… It’s incredible, and so unreal. This song sent me into a completely different dimension, where I felt as though I was standing face to face with something so much greater than myself, and I was trembling long after the song had finished. I’ll probably never have another song grip me as tightly as this has. I am proud to call this the most powerful song I’ve ever heard. Which songs do you consider to be the most powerful? Do you think ballads or rock songs are more powerful? How do you feel when a powerful song overtakes you? New feature, OMG! Thank you Sakura Pierce for letting me steal, uhh ahem ahem, borrow and pay appropriate tribute to your idea. 1.) If you don’t like the song “Resonance” by T.M. Revolution, GET OUT NOW. Just kidding. But that song is too cool fo’ school. 4.) Is anyone else sad about the end of the Fullmetal Alchemist manga/Brotherhood anime? The anime seriously helped to boost SID’s popularity. 6.) Speaking of XodiacK, I know this is impatient of me but I WANT A RELEASE! 7.) You know you have too much music when you scroll through your iPod and have a song called “I Love You” followed by a song called “I Still Love You.” Once your iPod gains the ability to reiterate, you’re in trouble. 8.) I’ve found that if you give a song the title “Rain” it is, like, predestined to be good. 9.) I feel like this year has me in a constant state of anticipation. One release drops and then I’m like “oh, wait but _________________ comes out next week! How am I going to stand the wait! ?” Its actually a pretty good feeling. Okay, all finished with my mental vomit there. Be sure to leave comments! Also, let me know if a weekly babble thingy is even worth the time and effort. Here’s another example of giving some uber strange music a chance. If you can get past the Latin-style guitar and raw, sometimes snarling vocals, then you’ll love this song. I have been listening to this song for about a week now and I get more into it with every listen. The video is also great because there is definite passion in the vocalist’s movements. Yeah, at first I thought he looked possessed as he thrashed around but then I came to appreciate that this way his way of feeling the music. Good stuff.